So im working on an ios app using Visual Studio 2015 in Windows connected by mac agent to the macincloud. Until now i havent had any problem, but today i just cant open storyboard. It give me an error like "The iOS Designer Mac Agent is not available. The iOS Designer requires an active connection to a Mac server. Please connect to a Mac to enable the designer. ", but the weird thing is that i am connected to the mac machine and i can debug in the ios simulator without any problem. I leave here a screenshots so you can see the error and check than im connected to the machine. I have the same problem. The log only say could not connect to remote mac: System.IO.EndOfStreamException: only read 0 of 4 bytes when the stream closed. 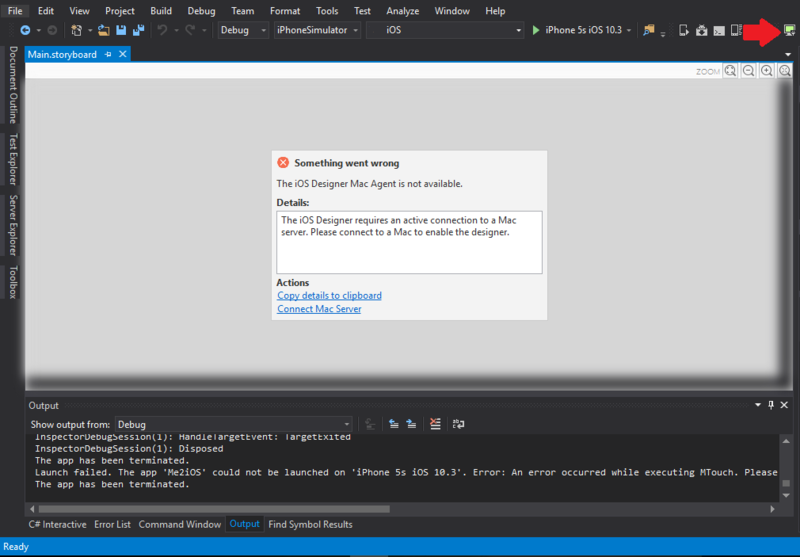 I can debug in the ios simulator but cant open the IOs designer. Please help! This problem is finally solved! I leave here the solution for my problem, because this can help someone. All i had to do was delete Xamarin folder in ../UserName/AppData/Local/Temp. @FreddyQuiroz My solution didnt help you? Have you already try it? Having the same issue with VS2017 preview version. Mac agent connected, but storyboards give the error that the OP commented in the title. Tried your solution @JosCarlosTeixeira but that didn't work for me. I tried with no success. Can you explain a little more what do you do with change the kind of networking bridge??? I tired help Me please! I was getting this error here. After i open the designer for the first time on the Mac within xCode and edited a storyboard or a xib file the designer on VS in Windows worked normally again. Deleting the temp folder didn't work for me. Nor was it a networking issue. For me I fixed it by installing an updated version of Visual Studio for Mac on my paired machine. This is from the Temp folder. Tried to delete Xamarin from Temp... nothing works, I am connected to the Mac and Simulator is working, only storyboard not. Have you tried installing latest visual studio for mac on the paired machine? Also update your vs2017 by looking at notifications. For anyone who is still running in this error try updating Mono on the Mac. It did the trick for me. This error is still available. In my case, i had the same error after updating my visual studio (on windows pc) some days ago. In my case, it was not the solution to delete the xamarin folder in local temp. With my network connection in my vm manager everything was fine, too. And at least i had update mono framework, but this was not enough and i still was not able to open the story board. At least i install visual studio on my mac vm ( i don´t had installed visual studio on the mac vm before, because i used visual studio on my windows pc), but after that the problem was solved and i can open the storyboard again.